Take the Blueway! Visit the Ports and Harbors of the Great Lakes Seaway Trail! Boaters interested in recreational port hopping along the Great Lakes Seaway Trail National Scenic Byway will find a new online resource at the ready with photos and service listings. 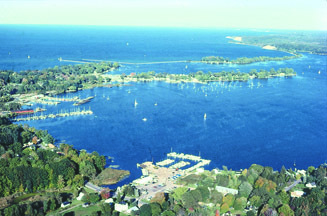 A series of expansive new aerial photos of the 518-mile-long coastal byway’s 24 major harbors is found online at http://www.seawaytrail.com/boating/. The Great Lakes Seaway Trail signed highway route that spans the freshwater shoreline of New York and Pennsylvania is an internationally-recognized water route for leisure boating. Each photo of the byway’s harbors is accompanied by a list indicating which of 14 services are found there. The list includes transient and seasonal docking, launch facilities, gas, diesel, repairs, pumpout, electric and water service, grocery, and nearby restaurants, lodging, attractions, and shopping. The website at http://www.seawaytrail.com/ also lists five distinct underwater discovery sites for scuba divers. 0 Comments to "New Resource for Boating the Great Lakes Seaway Trail"